1. Database Mail configuration should be configured for sending email notification. 2. SQL Server Agent service should run. xp_fixeddrives is an extended stored procedure that provides free space availability details of all the disk drives available in server/computer. 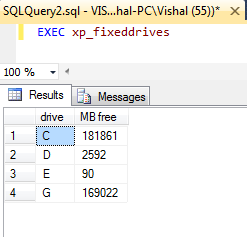 This stored procedure returns amount of free space available in MB. i. We have created a stored procedure named “GetServerSpaceStatus” that will return the disk drive name and its available free space in MB if any of the disk space is equal or less than 100 MB. We have set the criteria for insufficient disk space is equal or less than 100 MB. Below is the stored procedure that uses xp_fixeddrives extended stored procedure with filter condition of 100 MB or less free space of disk drive. name which is having insufficient disk space. --Storing drive name and free space(in MB) in variable. ii. Execute the stored procedure and check the email whether we have received mail or not. We can create a SQL Agent Job that should run continuously or with minimum time interval (1 or 2 mins). In this job, we can call the stored procedure GetServerSpaceStatus that will return Disk drive name with insufficient disk space. By using the above steps, we can implement Insufficient Disk Space Notification.